“Was that dock eight?” I asked the woman standing at the bow of the ferry. She was holding a small square microphone that perfectly distorted every announcement she made. 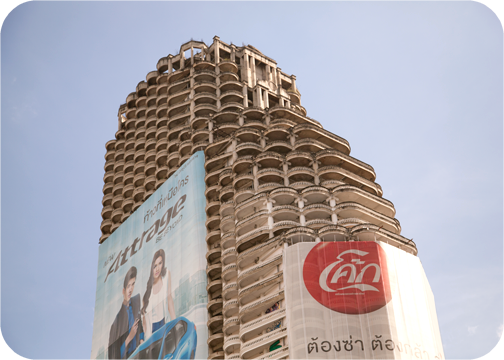 The boat had only stopped for less than a minute before veering back into the mocha waters of the Chao Phraya, the aorta of Bangkok. “Where did you want to go?” she replied. My sister and I got off at the next stop. As the hull drew alongside the dock, the intercom was a flurry of urgently scrambled reminders. People jumped on, people jumped off; the transaction was over in twenty seconds. 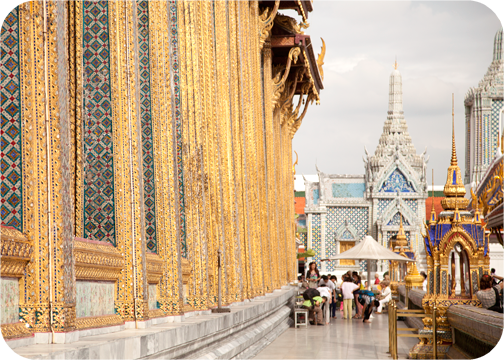 Nan and I were left standing on the Grand Palace pier. From the concrete pontoon, wooden planks led into a small building with low ceilings. For some reason the planks continued throughout the building so that everyone walked a foot and a half above the floor. A cat was curled up in the middle of the walkway, just under the lowest part of the ceiling. Just outside the dock the vendors had set up shop almost on top of each other. In the middle of the market were the makeshift restaurants. Their tables were low and covered with sticky plastic tablecloths and jars of spicy sauces. The most beautiful wats in Bangkok are scattered along the river like glass marbles. 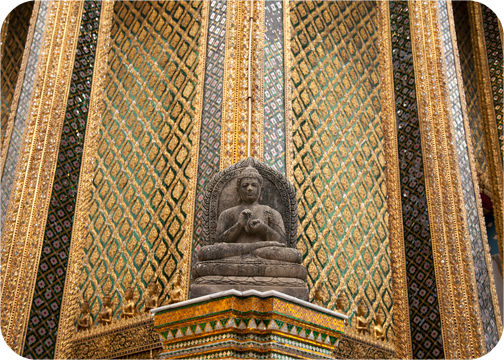 The Temple of the Emerald Buddha in particular is completely covered in small glass tiles. From a distance the walls shimmer like sunlight on water, up close the mirrored pieces have small dark splotches like liver spots. 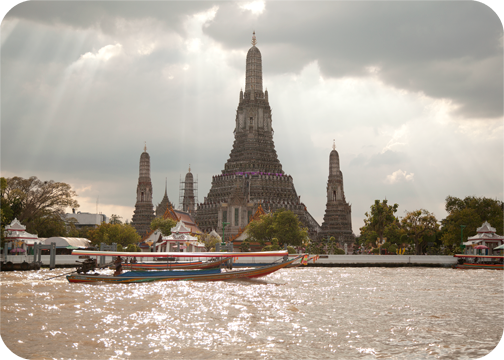 Across the Chao Phraya is Wat Arun, also known as the Temple of Dawn. The central tower, or prang, is decorated with ceramic tiles. Unlike glass, the ceramic pieces are cut from special bowls so that they have a delicate curve. The main prang is about 250 feet tall and is reached by steps so steep, it feels like you are climbing a ladder. 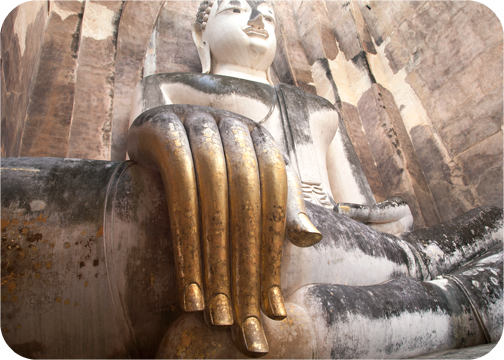 Sukhothai is several hours north of Bangkok and well known for its expansive temple complex. During better times, the historic center was enclosed within three concentric walls. Nowadays, you can move about freely with a moped and a handful of tickets. 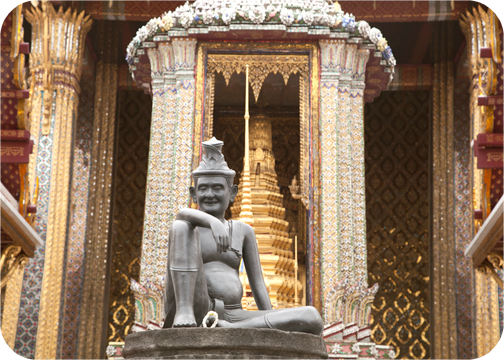 The most famous Buddha image (or at least the most recommended) is Wat Si Chum. 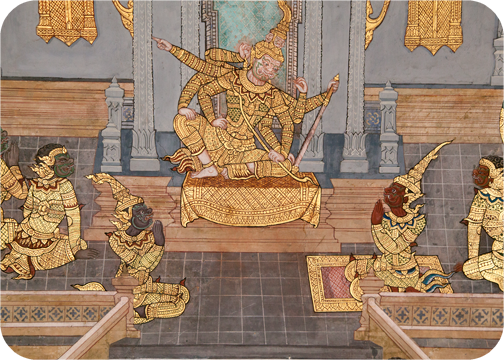 Built in the 13th century, this seated figure is slowly turning gold. 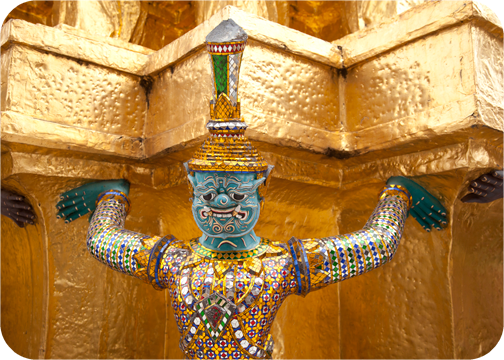 As a way to gain merit, worshippers in Thailand purchase small ½ inch pieces of gold leaf to transfer onto statues of Buddha. 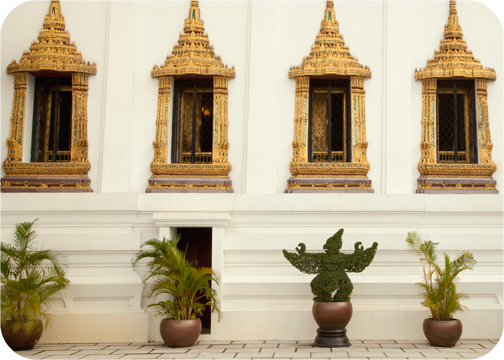 Putting gold on the back of the Buddha refers to doing a good deed without seeking attention. Just outside the western end of the Sukhothai Historical Park is a quiet uphill road lined with the ruins of smaller wats. 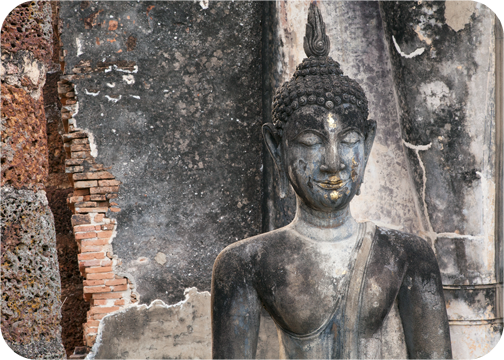 At the crest of the hill is Wat Saphan Hin, a brick ruin with a large standing Buddha and a view of the whole complex. By the time Nan and I had hiked up the slate steps, dusk was approaching and we were the only visitors. 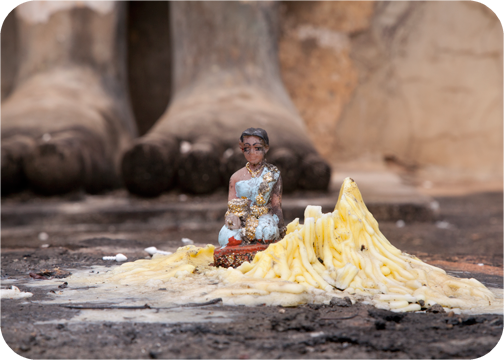 Even out in the middle of the woods, people had thought to bring a few pieces of gold leaf or a glittery figurine in prayer. It seemed a strange thing to take on a hike (water bottle- check, trail mix- check, gold leaf- check), but I guess if your afterlife is on the line nothing is out of question.